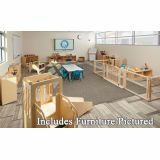 Includes : (3) Bowtie Tables & (1) Hub Table, 30"X60" Rectangular Table, 6 Plastic Chairs, 4 Ladderback Chairs, 3-Piece Play Kitchen, Book Stand, Dress-Up Island, See-Thru Sensory Table, Science Activity Table, Plenty of Storage, & more. 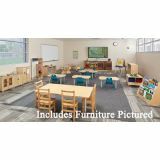 Includes : (3) Bowtie Tables & (1) Hub Table, 30"X60" Rectangular Table, Square Maple Table, 6 Plastic Chairs, 6 Ladderback Chairs, 3-Piece Play Kitchen, Pick-a-Book Stand, 4-Station Art Center, Light Table, Plenty of Storage, & more. 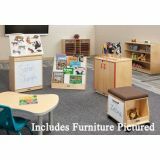 Includes: Big Book Easel, Mobile SideKick, Supply Cabinet, Bookcase, Mobile Paper Center, Pick-a-Book Stand, Cowtie Table, and Plastic Chair with Powder-Coated Legs. 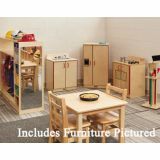 Includes: 30"X60" Rectangular Table, Kidney Table, (12) Plastic Chairs, 3-Piece Play Kitchen, Dress Up Island, Square Multipurpose Table with 2 Ladderback Chairs, (2) Double Sided Storage Islands, 20-Cubbie Unit and 8-Cubbie Unit with Trays, & more. 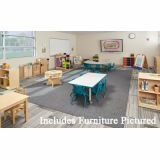 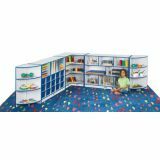 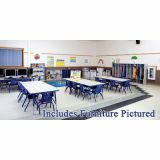 Includes: (2) 72" x 30" Rectangular Tables, (12) Plastic Chairs, (2) 5-Section Coat Lockers, 3-Piece Play Kitchen, Large Dress-Up Island, Duplo-Compatible Building Table, See-Thru Sensory Table, Science Activity Table, Big Book Easel, and more.